The farm market at the end of town announced this week that local asparagus had finally arrived. Hallelujah! We stopped there today and bought a bunch of fatties, plus a bag of tiny spuds, and a dozen pastel colored eggs from a nearby farm. 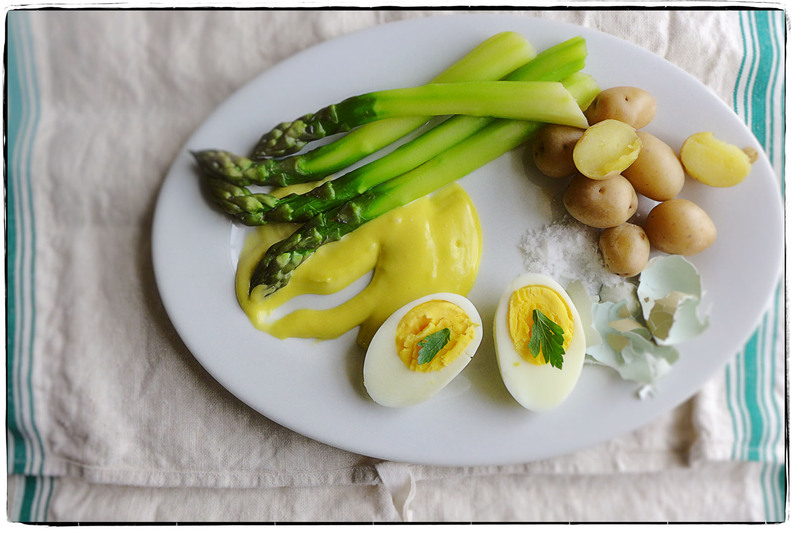 We knew lunch would be simple today—poached asparagus, boiled potatoes, and hard-boiled eggs—but we wanted to make it a little luxurious as a treat to end the week. So we made a true aioli to dip into, and poured ourselves each a splash of white wine. Have a lovely spring weekend, dear friends. Make yourself a mint julep. We’ll cross our fingers that your horse wins!